I've been training and teaching for 20 years. I have had many major accomplishments, on the trial field. I was reserve at the National Finals Nursery in both 2001 and 2008. I have a very extensive judging resume; and have judged every major trial in the U.S. and Canada. I enjoy judging as a way to give back to the sport. On the training field, I believe there is no shortcut and no cookie cutter method. I like to take each individual dog/ and their handler and use the method that works for them on an individual basis. Not all dogs are alike, I always take that into consideration when training a particular dog. I condemn the use of shock collars and would never allow one on my property. We achieve goals by hard work and dedication. I do not believe in putting undue stress on a dog and teach them accordingly. My students must be willing to work hard and be consistent to establish their goals. I teach clinic style, therefore all classes are group style. I believe people can learn from watching others work. I run a big variety of sheep, from farm flock, to un-broke yearlings, to lambs. I always make sure everyone is appropriately matched with the sheep and field they are working in. There is no such thing is one size fits all when training sheepdogs. My training facility was originally in Campo, CA. where I met the love of my life Ron. (Last name was pretty perfect too!) 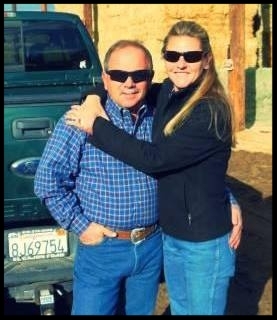 When Ron retired from a long career of law enforcement we bought a beautiful 52 acre ranch in Ranchita, CA. In 4 years, we have built up a beautiful training facility! Ron has been my main support system, from building all my equipment, to hauling me down the road. There are not too many days that Ron and I spend apart Ron loves the dogs as much as I do. At the dog trials Ron is known as the chef extraordinaire cooking typically on wood fire and keeping my calories up during the competition. Outside of dogs and cooking we enjoy horseback riding, kayaking and hanging out with close friends! Everyone is welcome to the ranch, you'll be treated to great food, and a lot of fun here at the ranch cantina known as the "Silver Bullet Saloon"
Visit our "training ground" page, and our "services offered page to see what program works for you!